SNOW! We got some SNOW! It is all white and Beautiful right now… probably won’t last long but it is worthwhile to enjoy it while we can! People are loving it! We like the snow in the winter. Usually we have about 10 inches of snow in January so a couple of inches of snow isn’t an event! Heres Hoping we get another couple of inches! Someone who is loving every drop of snow right now is Smoky Jo! 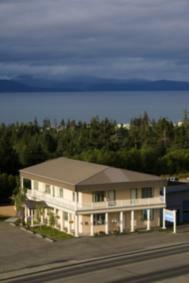 Want to check out the conditions on the Homer Spit? This Web cam updates every minute or so! What can I say, Debra, but simply gorgeous! Now, that being said, you can keep your snow and cold! we love it Nina Hollander we were doing a little snow dance yesterday and it worked! Thank you! You have to love, Debra, to live there.... I love winter scenes in art, but hate living in the cold. Still would like to visit in person one day and see all that majestic beauty. Come in July or August Nina Hollander it is absolutely gorgeous and warm enough for most folks!!! And you can escape the heat of the lower 48! Thank you Robert (Alaska Bob) Swetz I always appreciate YOU!